The Trainer object contains all information used in a training loop, e.g., models, optimizers, updaters, iterators, and datasets, etc. This makes it possible to change settings such as the learning rate of an optimizer. Then you can add this function to a Trainer object via extend() method. It lowers the learning rate every 10 epochs by multiplying 0.1 with the current learning rate. The difference between the above example and this is whether it has a default trigger or not. In the latter case, lr_drop() has its default trigger so that unless another trigger is specified via extend() method, the trigger specified in make_extension() is used by default. The code below acts the same as the former example, i.e., it reduces the learning rate every 10 epochs. There are several attributes you can add using the make_extension() decorator. trigger is an object that takes a Trainer object as an argument and returns a boolean value. If a tuple in the form (period, unit) is given as a trigger, it will be considered as an IntervalTrigger that invokes the extension every period unit. For example, when the given tuple is (10, 'epoch'), the extension will run every 10 epochs. When both extend() and a given Extension have triggers, the trigger given to extend() is used. When None is given to extend() as the trigger argument and a given Extension has trigger, the trigger given to the Extension is used. When both trigger attributes in extend() and Extension are None, the Extension will be fired every iteration. See the details in the documentation of get_trigger() for more information. An Extension is kept in a dictionary which is a property in a Trainer. This argument gives the name of the Extension. Users will see this name in the keys of the snapshot which is a dictionary generated by serialization. PRIORITY_WRITER: The priority for extensions that write some records to the observation dictionary. It includes cases that the extension directly adds values to the observation dictionary, or the extension uses the chainer.report() function to report values to the observation dictionary. Extensions which write something to reporter should go first because other Extensions which read those values may be added. PRIORITY_EDITOR: The priority for extensions that edit the observation dictionary based on already reported values. Extensions which edit some values of reported ones should go after the extensions which write values to reporter but before extensions which read the final values. PRIORITY_READER: The priority for extensions that only read records from the observation dictionary. This is also suitable for extensions that do not use the observation dictionary at all. Extensions which read the reported values should be fired after all the extensions which have other priorities, e.g, PRIORITY_WRITER and PRIORITY_EDITOR because it should read the final values. See the details in the documentation of Trainer for more information. You can specify a function which takes a Trainer object as an argument to finalize the extension. It is called once at the end of the training loop, i.e., when run() has finished. You can specify a function which takes a Trainer object as an argument to initialize the extension. It is called once before the training loop begins. This is the way to define your own extension with the maximum degree of freedom. You can keep any values inside of the extension and serialize them. This extension PolynomialShift takes five arguments. attr: The name of the optimizer property you want to update using this extension. power: The power of the above equation to calculate the learning rate. stop_trigger: The trigger given to the Trainer object to specify when to stop the training loop. 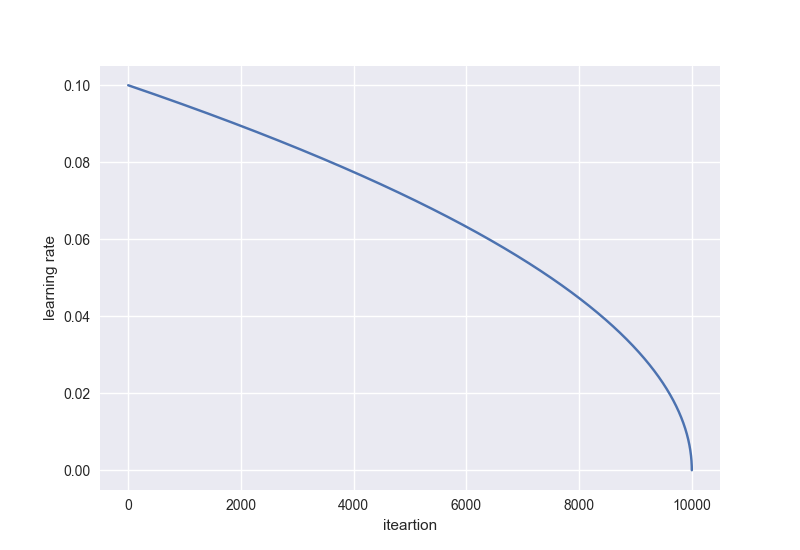 len_dataset: The length of the dataset, i.e., the number of data in the training dataset. This extension calculates the number of iterations which will be performed during training by using stop_trigger, batchsize, and len_dataset, then stores it as a property _maxiter. This property will be used in the __call__() method to update the learning rate. The initialize() method obtains the initial learning rate from the optimizer given to the Trainer object. The serialize() method stores or recovers the properties, _t (number of iterations) and _last_value (the latest learning rate), belonging to this extension.